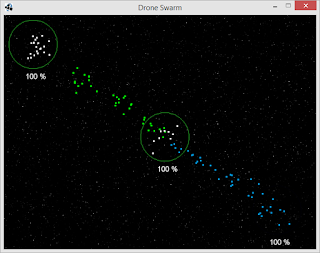 Today after long time I've put some time together to work on a small prototype, inspired from Swarm RTS. 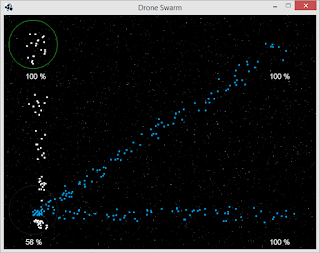 Drone Swarm is a single player real time strategy game where player controls a lot of small drones and fight against AI controlled players to conquer the galaxy! Drones moving to the center of the map, but AI try to defend..
My idea is to work a little bit on this small prototype in the future, in particular add a proper AI, levels and more players to interact with it. When I will have a solid foundation I hope to work on gameplay elements and create, hopefully, something unique. p.s: any suggestions or feedback are welcome, even on early stages! You can introduce some different types of drons. 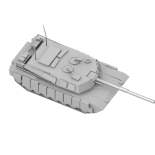 For example scouts, light armored but very fast with long view range. Fighters, general purpose. Bombers, slow but heavy armed, designed to attack planets. Well, I'll have to try this out. Let me know what do you think ! Version 0.2 is up on itch.io and gamejolt! In this update I've just added a neutral zone, so player can conquer it and take advance of it! Version 0.3 is up on itch.io ! - simple AI that attack player stations and drones! Another thing is that the selection color does not go back to white and units often just stop moving after fights. It runs well (until it lags because the unit production is infinite) though and the flocking looks good. thanks @VaTTeRGeR for your feedback! I agree selection could be more intuitive, I hope to create something like an RTS (Starcraft, Warcraft) following your advice, really appreciated! Version 0.4 on itch.io ! This time I've shared more toughts on this release and future work, so feel free to try the game and feedback! @VaTTeRGeR: what do you think about new selection mode? The selection is nice now! Now AI it's a little bit stronger and yeah circles around bases are gone for now, I'd like to find a better way to display them in the future! I checked your newest version of the game. Looks pretty good. However, I cant win because AI very fast moves its drons toward top-right corner base and gets the adventage. Is there another base which player can capture to get more drons and counter-attact AI? Version 0.5 is on itch.io and thanks to meva, I've fixed AI and added 3 levels, let me know what do you think about it ! Great job:). Now I finished your game and had much fun playing it. I like the dynamic of the game. There is one thing which could be improved. When you move units somewhere they do not come back to base neither automaticaly attack ememies around. So, player has to pay attention to units far away to group them and push forward. Not too much crazy, but another little step on right direction! Let me know if you find any bug or you have any suggestions, much appreciated! Hi, I tried your game. Great job:). Levels are cool and very playable. However, the game is going on a little to fast for me. For example, you can slow down the speed of ships creation, so player will have time to think about strategy. On the other hand, it is also funny when you have to react fast and intuitive:). You can change ships creation speed from level to level or even from planet to planet. Nice step forward:) I had fun playing your game. What is the condition for capturing the enemy main base? When your first unit get there or when you kill all enemy units in the base? Good idea with changing colors when your enemy is taking back a base. Cool little game! Fun initially, but gets repetitive very quickly as i constantly drag left click.. right click.. drag left click... right click... drag left click... you get the idea. I don't really see why that's necessary when i could just select a base and tell it to constantly send drones to a destination instead. That would spare me a lot of unnecessary clicking. @Gjallar: you are right, it's something I have to reconsider if I plan to work make another release, maybe a game where you can simply "set lines of attack" could be more interesting ?